Surprise and delight them than with this colourful gift bag full of flowers. With vibrant shades of burnt orange, hot pink, sunshine yellow and deep purple, this selection is a celebration of colour and a real feast for the eyes. Our Ellon Florists have over forty years of experience int he floristry business under their belts so its safe to say they know a thing or two when it comes to floral arrangements. 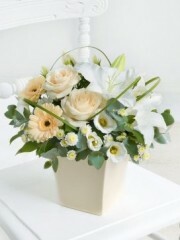 With abundant passion and a strong work ethic, our Ellon Florists are able to create the most stunning bouquets perfect for all occasions from birthdays to congratulatory events such as passing a driving test or an exam all the way to weddings so no matter what it is you're looking for, we have the perfect flower arrangement for you. All our flowers are directly imported to us all the way from our suppliers in Holland to ensure our flowers are of the best quality and with up to four deliveries - per week, not only are our flowers of the best quality but they are also the freshest. This means that all our flowers have a high longevity and will be able to last for many days to come for the enjoyment of your recipient. 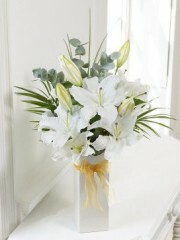 When it comes to the bouquets themselves, our Ellon Florists weave together a mixture of gorgeous flowers - such as elegant calla lilies, tradition roses, exotic orchids and gladioli amongst many, many others - and dense, lush greenery such as pittos and eucalyptus leaves to create a full, rounded bouquet body. Once the bouquet has been arranged, our Ellon Florists finish off all our bouquets with an artistic flourish using vibrant yet simple tissues, papers and ribbons or alternatively, they can arrange your flowers into a vase, box or even a cute teacup depending on what you're looking for. Additionally, some of our flowers - such as orchids - come in a potted variety. You can have a browse through our bouquets up on our website however if nothing quite catches your eye, don't worry as we offer our customers the bespoke service. Through the bespoke service, our customers can work in collaboration with our Ellon Florists to create the perfect bouquet for your recipient. Our Ellon Florists hold you as their number one priority so no matter how big or small your request is, they will do everything within their capability to provide you with the most stunning bouquets. Not only do our Ellon Florists provide our customers with gorgeous bouquets but they can also arrange for a gift to accompany your flowers as we have a gifts range on offer here. Our gifts range includes a selection of delectable wines and champagnes; luxurious Belgian chocolates; adorable teddy bears; fruit baskets in varying sizes as well as balloons which, if requested by a customer, can be arranged into a lovely balloon bouquet by our talented Ellon Florists. Once your order has been organised by our Ellon Florists, our customers have the choice to use one of our several delivery choice if you so wish it. We have our standard weekly delivery Monday to Saturday, our next day delivery as well as our same day delivery service. Our same day delivery service allows our customers to place an order and have it delivered on the same day which means our Ellon Florists arrange your flowers on the day. If you wish to use this service, your order must be placed before 3PM to give our Ellon Florists enough time to get everything together for you. Distance is also not a problem for us as we are part of the Interflora delivery network which means we are able to deliver locally, nationwide as well as abroad to over 140 different countries worldwide so no matter where your recipient resides, your order will safely arrive in pristine condition to your desired location. Once your order has been placed, we want our customers to know that our Ellon Florists want to take care of everything on your behalf so you don't need to worry about a single thing.